Pregnancy may be littered with ailments. Fatigue, nausea, aches and pains, bed rest. Try not to let these ailments wear on your general mood. Take advantage of the days and weeks when you feel good and do something good for yourself and your baby, or babies! 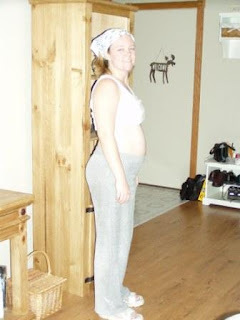 I began doing Yoga in my first trimester. I didn’t do it every week, but I did go to a class with a friend, which helped motivate me and keep me honest about showing up! I highly recommend finding a workout buddy. We both traveled over 20 minutes to meet to work out, but since we didn’t have kids, it worked out. In fact, it was a nice way to spend time together even though we were at different stages in our lives. I was pregnant; she was unexpectedly single only a few years ago. After the yoga series was over, we continued to meet up and do elliptical machine and stretching together. I really treasured the connection that working out gave us, and blessing of all blessings, she found her future husband during that time! But if you don’t have a workout buddy, or can’t get out of the house, you can surely at least find a prenatal workout video and even prenatal yoga on DVD. Note though, that I did NOT overdo it. While I didn’t check my heart rate, I was easily able to keep conversation with my friend the entire time, which is an important indication that I was not over-exerting myself. Note that I did this with the blessing of my doctor who advised me only to take pre-natal yoga, and do non-jarring machines like bikes or ellipticals. I will admit however, that I never asked when I should stop though! And I kept it up well into my 7th month! Finally my belly was too big to be comfortable lugging it around a gym and I had such a blood volume within me that I was too easily fatigued. When this happened, I’ll admit I spent a lot of time lounging on my couch like a beached whale, or soaking in the tub. But rather than become completely sedentary, I began swimming. This really was beneficial not only for the exercise and circulation, but it was a heavenly way to get the weight of my babies off of my belly! I remember swimming in the water just dreaming that I could take a nap there! I actually went swimming every few days, and even the day before I delivered at 39 weeks! Of course, you should check with your care provider about exercising during a multiple pregnancy, but if he or she completely discourages you from any activity ‘just to be cautious’, I would question that recommendation or seek a second opinion. I don't believe a healthy mom should not be discouraged from physical activity simply because she is pregnant with more than one baby. There it no research to show it is detrimental, and unless you have other risks, and especially if you were active before pregnancy, there is nothing to be cautious about until much later in pregnancy.